Researchers have scaled up a powerful fluorescence imaging technique used to study biological processes on the cellular level. Previously limited to samples just millimeters in area, the expanded approach can analyze samples with areas up to 4 square centimeters. With further development the new approach could find use in the clinic as a sensitive and precise method for identifying the edges of tumors during surgery. In The Optical Society (OSA) journal Optics Letters, the researchers demonstrate the first confocal microscopy based macro-FLIM system with cellular resolution and high molecular sensitivity. They used it to observe the metabolic processes inside a whole tumor in a live mouse, a feat that isn't possible with current FLIM systems. 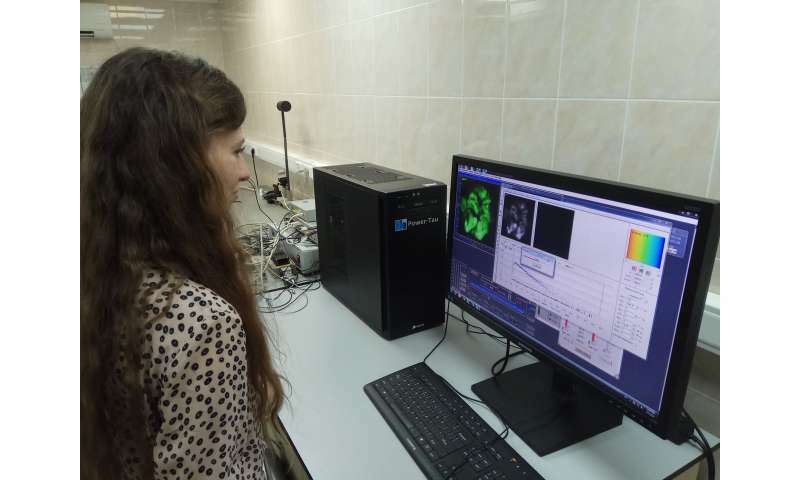 The new system was produced through a close collaboration between engineers and physicists from Becker & Hickl GmbH, Germany, and biologists from Privolzhskiy Research Medical University, Russia. Typically, FLIM is performed using laser scanning confocal microscopy, which achieves high resolution by scanning a laser beam across a fluorescent sample to form an image. To obtain FLIM information on a macro scale, the researchers developed a confocal macroscopy system that incorporates lasers with extremely short pulses—only picoseconds in length—and very sensitive detectors to sense the fluorescence. The system also included electronics that count the photons and plot their distribution in relation to the time since the laser pulse and the position of the laser beam on the sample.